Roselyn and Mike, innkeepers at R.R. Thompson House in Oregon’s Willamette Valley, have greeted guests from nearby towns and cities in Oregon to the state of Maine, as well as those from other countries. We enjoy meeting people from around the world and delight in sharing our home with them. We enjoy hearing the stories they share with us, whether it relates to travel adventures, career or family. R.R. Thompson House has five beautifully appointed suites and rooms, each named after a flower which can be found in the artistically designed gardens. The spacious Rose and Lavender Suites and the more intimate Magnolia, Lilac and Garden Rooms all have deluxe, pillow top king or queen mattresses and crisp, luxury linens. When you choose R.R. 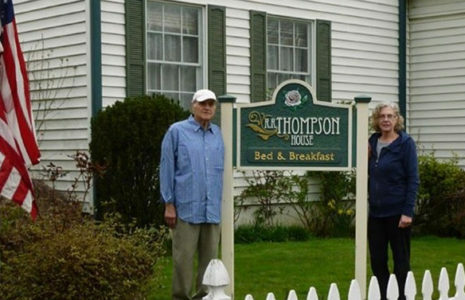 Thompson House as your lodging choice in Carlton you’ll create the perfect wine country get-a-way. Stroll just a few blocks to the explore dozens of small wineries, unique shops and wonderful restaurants in Carlton’s historic pioneer downtown.